The Traveller Accommodation Services Price Index (TASPI) declined 19.3% in the fourth quarter. The index has decreased in the fourth quarter every year since its inception, as lower seasonal demand typically drives down accommodation prices in the fall and winter. Both leisure (-22.3%) and business (-16.1%) clients paid lower prices in the fourth quarter. Prices for traveller accommodation services were down in nine provinces and two territories. Lower prices in British Columbia (-32.0%), Ontario (-15.9%), Alberta (-14.9%) and Quebec (-16.9%) contributed the most to the decrease. Higher accommodation prices in Manitoba (+0.3%) and the Northwest Territories (+0.7%) somewhat moderated the decline. Prices for leisure clients fell 22.3% at the Canada level, largely due to lower prices in British Columbia (-33.9%), Ontario (-19.9%), Alberta (-16.7%) and Quebec (-19.4%). Prices increased in the Northwest Territories (+1.2%). Prices paid by business clients decreased 16.1% at the Canada level. The decline was driven by lower prices in British Columbia (-29.2%), Ontario (-11.6%) and Alberta (-13.4%). Meanwhile, business clients paid higher prices in Manitoba (+3.0%) and the Northwest Territories (+0.2%). The TASPI fell 3.3% in the fourth quarter compared with the same quarter in 2017. Accommodation prices declined in 2018 after hitting record highs in 2017, coinciding with Canada 150 celebrations. Lower prices for both leisure (-4.2%) and business (-2.5%) clients contributed to the year-over-year decrease. Lower prices were reported in nine provinces, led by Ontario (-4.0%) and Alberta (-4.3%). These declines were partially offset by higher prices in Prince Edward Island and all three territories, most notably Nunavut (+12.4%). 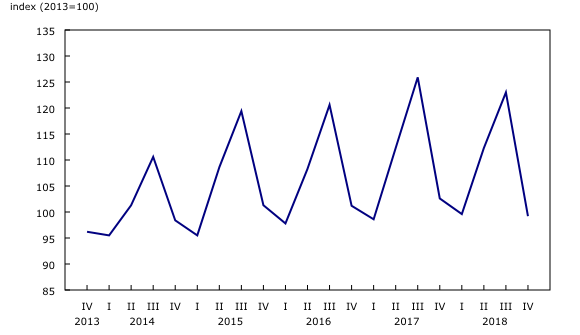 The Traveller Accommodation Services Price Index measures the monthly and quarterly price movements of short-term accommodation services. This index reflects changes in room rates (excluding all taxes) and covers hotel and motel lodging services.